Squash House Quilts: Look What Vinnie Did! I enlarged the pictures and you and Vinnie make a fantastic team. This quilt is stunning! Way to go on creating a new heirloom! Now I'm wanting a Vinnie of my own!! Love it. Beautiful. Vinnie has a lot of work ahead to keep up with your creativity. Love the quilt! Ummmmm, I give you a BIG, FAT deserving A++++++++!!!!! Candace, it's so gorgeous!!! You did such an amazing job on the quilting!!! I love your mix of freehand and stencils!! I wish I could see the quilt in person. I'm beaming with pride for you!! On the contrary, look what Candace did with Vinnie's help! I think it looks wonderful and am questioning that C. I think you're a natural. Yay for Vinnie and a HUGE H-U-R-R-A-H for Candace, who drove Vinnie. Great job, my friend. I can't wait to see the next one! An amazing team effort! 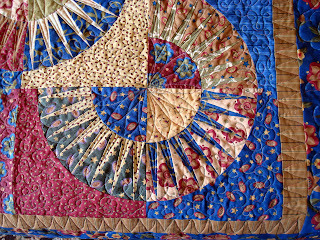 I really love the quilting in the circle/points part. I think you deserve way better than a "C". It's beautiful. You did a great job quilting your Beauty! Vinnie and you are really doing well together! I definitely not too tired of hearing about your quilt. It is a beauty. So many perfect points. Beautiful quilt! You and Vinnie work very well together. I look forward to hearing what you find out about marking pens - please share your responses. I have yet to find the perfect one. I'm not a long-armer, but usually need to mark the quilts I quilt on my sewing machine. Beautiful, Candace, absolutely beautiful. You have a special talent !! Beautiful quilt; great job you did with your new machine. Have a great weekend! It turned out just beautifully!! You did a fantastic job with the assistance of Vinny, but really it was all you. You should stand proud! Woww! it's absolutely awesome. I love how you've used the block design and the fabrics themselves to decide how to quilt it. 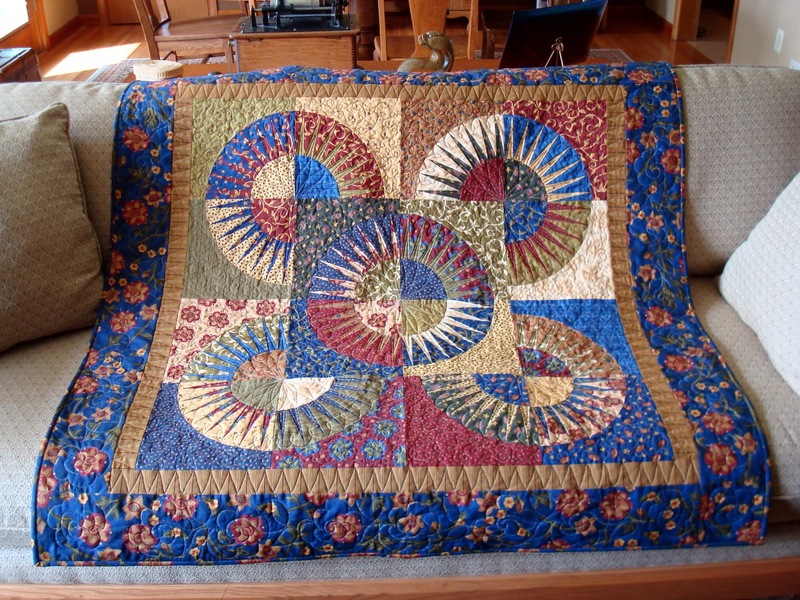 Vinnie just helped you do this beautiful quilting on your amazing quilt. Beautiful quilt Candace, love the quilting, what a treasure you have in it. What an amazing quilt, totally awesome! Vinnie, with a little help from Candace did a fabulous job! I would never get tired of looking at this quilt. Just stunning! Wow, Candace, beautiful work! I really like the points in the center of the circles. If that's a C, I can't wait to see an A! Wow! It is stunning. Your quilting is fantastic, Candace! Wowzers! That is a gorgeous quilt! The fabric choices and piecing and your quilting is magnificent! What is with the C+? You deserve and A+ on this! Love it! Love your husband's pillow too! Cute!